Unions are making it clear that Democrats crafting a new health care plan for America must not go too far in appeasing a health insurance industry intent on maintaining its profits. A major thing labor wants to see included in any final plan is a public option to enable coverage of all the uninsured. One of the lawmakers who has been feeling the heat is Max Baucus (D-Mont. ), chair of the Senate Finance Committee. A delegation of workers who belong to the American Federation of State, County and Municipal Employees in Montana descended on his office in the nation’s capital May 14. They reminded him that the AFL-CIO in Montana had endorsed single-payer health insurance a year ago and that there had been strong support for the concept at town hall meetings called by the senator himself in Montana. The lobbyists were part of a crowd of 700 AFSCME delegates who covered Capitol Hill to lobby lawmakers on health care, the Employee Free Choice Act and to demand that more money be invested in programs that benefit workers and their families. When Ken Allen, the union’s Oregon state chair, came out of a meeting with Sen. Ron Wyden (D-Ore.) he told a gathering of fellow union members outside that the senator “wants to force everyone to buy health insurance and has no public section of his health care bill to cover the uninsured. We pushed him very hard on a public plan and he wants to tax our health benefits.” The union members booed. Allen promised that unions in Oregon “will put the whoop on” Wyden to shift his positions. 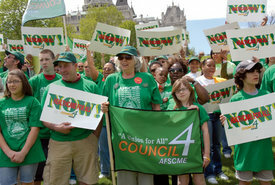 AFSCME is only part of a steady flow of unions coming into Washington to buttonhole legislators this May and June. Last week it was union nurses and next week it will be all of the construction unions. In June the Communications Workers of America will make its lobbying effort in the capital. The action is heating up in the wake of a health care “summit” called by President Barack Obama on May 11. House Speaker Nancy Pelosi (D-Calif.) has said there will be a vote on a comprehensive health care plan before Congress goes on its break in August. 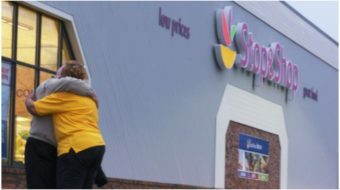 Feeling the heat, health insurance companies and hospitals have come forward to pledge cuts in costs. Most observers, however, don’t hold out high hopes for those promises. Some on the Baucus committee are insisting on strong action to curb the power of the insurance companies. Sen. Charles Schumer (D-N.Y.) has promised to push for a publicly run alternative to private insurers, as part of the final health care package. The AFL-CIO supports the public option, both to cover the uninsured and as a way of keeping the private insurers “honest,” as federation President John Sweeney has put it. Health care advocates note that the money referred to by Sweeney goes into the insurer’s pockets for advertising, overhead, profits and high executive pay. Health care activists estimate that 98,000 people a year are dying as the direct result of denials for coverage issued by insurance companies. “A public health insurance plan is essential to achieving affordable and quality medical care,” Sweeney said. The unions are also making the case that economic recovery depends upon an overhaul of the health care system. Some legislators have responded well to the lobbying efforts of the trade unionists. Kevin Darby, a union member from Wisconsin, said he found at least one veteran lawmaker determined to fight for healthcare overhaul with a strong public option.